← Panhandle Chapter to show double feature of “Red Gold” and “Eastern Rises” at Little Panida on Wednesday May 22 to support the Save Bristol Bay Campaign. The Idaho Department of Fish and Game has developed a draft Management Plan for the Conservation of Westslope Cutthroat Trout in Idaho. Westslope cutthroat trout are a native species and an important game fish. They occupy an estimated 80 percent of their historical range in Idaho. The draft plan discusses the population status of westslope cutthroat trout in major watershed groupings and the conservation actions the Department intends to pursue to protect and enhance populations and habitat across the species range in Idaho. The Panhandle Chapter of Trout Unlimited is preparing to draft formal comments and would like your input. 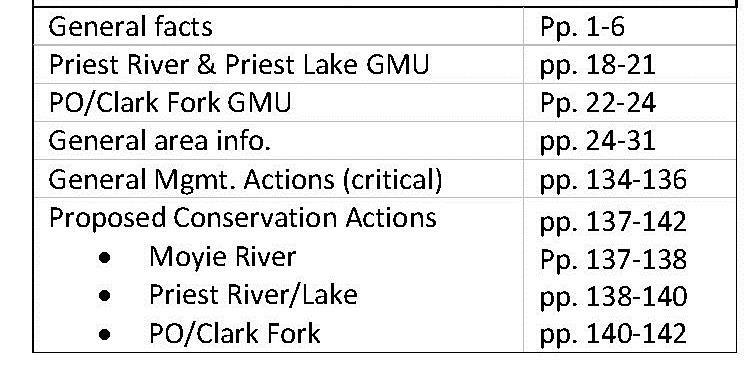 In the interest of brevity, we have selected pages (below) that we feel should be reviewed by those in the Moyie, Clark Fork/ Pend Oreille and Priest River drainages, i.e. most of our members. Mauser, aware of any comments on the plan. We will be making an official response before the deadline of July, 26, 2013.